One of the clubs groomers getting ready to go out. It’s a beauty. 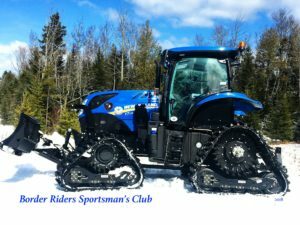 Snowmobiling is a favorite activity in Jackman during the winter months and of course, the trails and grooming are thanks to the Border Riders Club. Below are a few winter events the have planned. February 9th – Pot luck dinner at the clubhouse 6 pm with a meeting to follow. Everyone is welcome. Stop by, eat good food, and meet the officers as well as many of the people who work on our trails. February 16 & 17th – Barn Fundraiser held at Long Pond Grooming Equipment Barn – 8 am to 4 pm all kinds of food for a donation toward the trails system.